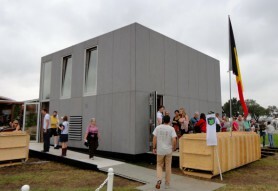 Ghent University presented an innovative idea to create a home that could be easily transported and assembled by a homeowner for the 2011 Solar Decathlon. They utilized simple design and called it the E-Cube. 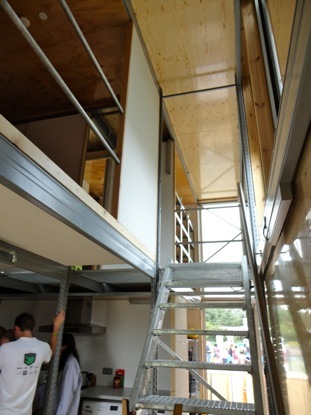 The University of Ghent created the E-Cube for the 2011 Solar Decathlon, a home kit that could be quickly assembled without the use of heavy machinery. 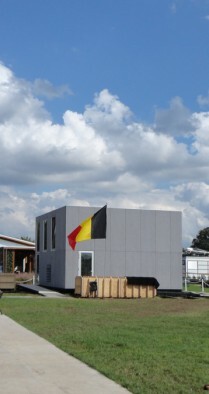 The E-Cube was the first Solar Decathlon entry from the Belgian university. 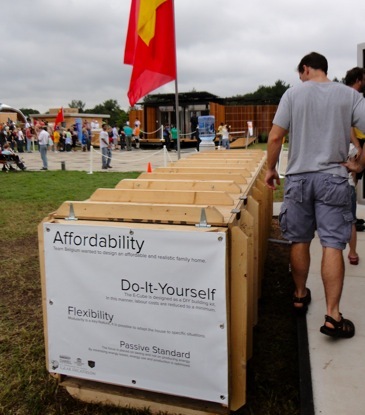 They had the goal to create an affordable home that could be easily built from a few boxes. (It is strikingly similar to the process of getting furniture at an IKEA store: purchase the furniture in boxes, then take it home and assemble it.) By keeping the process of building a home easy and affordable, it allows someone without heavy construction skills the ability to build and have a home, ideally – without having to be dependent on a financial institution. It could be the ultimate DIY housing solution. 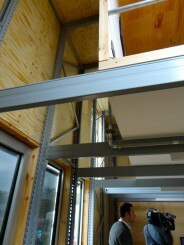 The home can be transported in small boxes for assembly on site. It’s an ideal ‘plug-and-play’ concept that dominates the consumer electronic market. 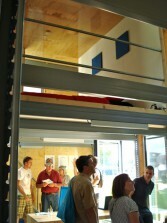 The University of Ghent simply applied the concept to housing. This is exciting because of the current difficulties in obtaining home financing. It has become prohibitive for many potential new home owners while the expensive undertaking of financing a house is also hindering overall economic buoyancy and recovery. 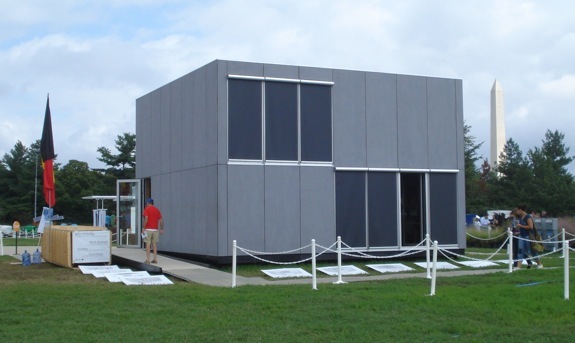 Because the E-Cube home can be built in stages, it gives the consumer the option to upgrade to different finishes or utility systems as funds allow. The concept of this house would be a welcome addition to the current housing market. For example, the enterprising new homeowner can customize and elect to add additional features like solar panels, custom finishes and additional rooms to the home as funds allow. The home uses uniform sizes for both the siding and windows. The home can be easily transported because of the uniform and compact nature of both the cement fiber siding panels and the equally sized windows. It ships in three large containers and can be assembled by the average person with common hardware tools like a screwdriver and hammer. Once done with the outer shell, the configuration inside the house can also be assembled. 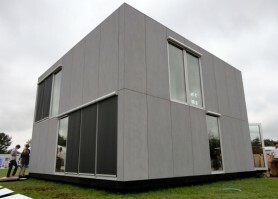 The team estimated that the E-Cube home could be fully assembled in a few days. This brings back the idea of raising a house, where neighbors once came together to raise the frame of the house. Instead of hiring construction crews to build the different stages of a house, once the taps are set and the foundation done, enterprising neighbors could join together to help each other build and snap together their neighborhood. There seems to be an ample amount of head space, while the use of industrial shelving is used to divide the cube into two floors. The home features a large interior space divided by – drum roll – an industrial pallet racking system, otherwise known as industrial shelving. It is used to support the second floor, that consists of a bedroom and bathroom. 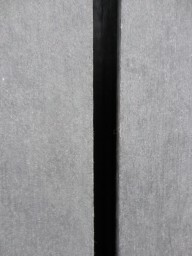 This type of building material has already been accepted within Belgium’s building code. The use of shelving to create the second floor allows the homeowner to quickly assemble it by snapping or placing the beams and floors into place, without the use of heavy machinery. The electrical system has also been integrated into the ‘snap-into-place’ assembly process allowing for a relatively simple electrical installation process. The metallic nature of the house gives it a modern, industrial feel. A stairway allows access to the second floor. The large windows located throughout the building allow for natural light to fill the house. The windows were triple glazed and had shade coverings located on the outside of the house. Their operation can be controlled by a smart phone app, allowing for simple home control. While this home is not specifically by-the-book passive solar, it was built with the Passive House Standard, that requires a building to have a tight, insulated envelope that allows the house to use less energy than a conventional heating and cooling system. 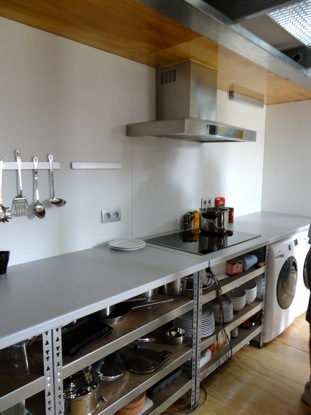 The compact kitchen also houses the washer and dryer. The home featured a small and efficient kitchen. Notice the washer and dryer tucked under the right hand side of the kitchen counter. This type of configuration makes the installation of the water supply systems more efficient by keeping the plumbing in close proximity, without long pipes and hot water runs. The solar photovolatic (PV) panels that supply the home with solar based electricity are tucked away on the top of the house, fixed on the flat roof. Even with its solar panels, the E-Cube was one of the most affordable homes in this year’s Solar Decathlon, tying for first place and getting the full 100 points in the Affordability category. Overall, the idea of a an ‘snap-into-place’ house is a great one. This would be a welcome addition to the affordable housing market to supplant the long, rectangular ‘mobile home’. While ‘mobile homes’ are affordable, they are typically built to only last about 10 – 15 years. The goals of making a house that is affordable, accessible, efficient, easily assembled and customizable are noble ones indeed. 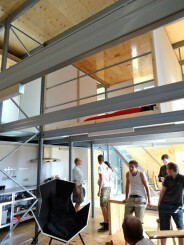 Great job to the team from Belgium who traveled over the Atlantic to participate in the 2011 Solar Decathlon. Click on a picture to enter the gallery. Click on the right side of the photo (or use the arrow keys) to proceed to the next one. Click anywhere in the darkened space or on the “X” to exit the gallery. 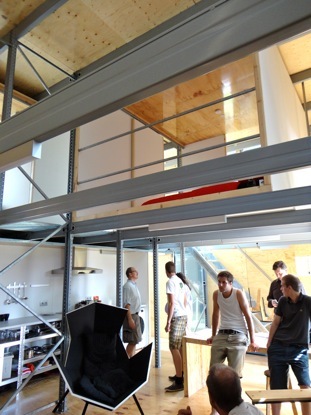 The University of Ghent created the E-Cube for the 2011 Solar Decathlon, a home kit that can be quickly assembled without the use of any bolts. The team tied for first place in the Affordability category and also scored well in the home entertainment category, with a 5th place finish. Overall, the team placed in 16th place in the 2011 Solar Decathlon. 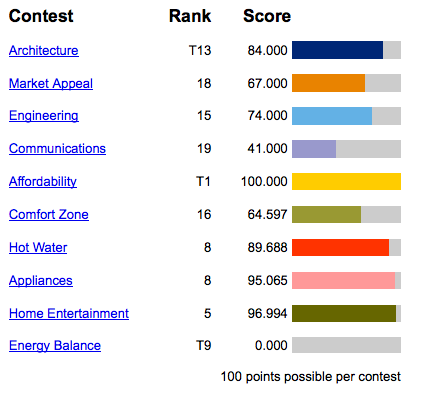 A screenshot of the final scores for Ghent University from solardecathlon.gov. Take a look at the video and links below for more information on the E-Cube. 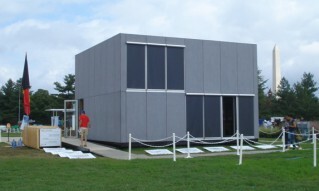 See the original model of the E-Cube entered into the 2011 Solar Decathlon.